The origins of the SOSAT Choir are almost legendary. The choir seemed to take life out of nothingness, generated by collective consciousness after the experience of the world war and the exile. The legend began with its first public concert held in the big hall of the Buonconsiglio Castle, behind a screen, on 24 May 1926. One day, a few years earlier, legend has it that Tullio Antoniutti was working in the laboratory of the technical college (Istituto Industriale) in Corso Buonarroti, when he suddenly started whistling the “Piave song” (a famous patriotic war song); from the other side of the room, Mario Pedrotti replied in the same way. Tullio and Mario were soon joined by Enrico, Mario’s brother, and Riccardo Urbani, Tullio’s friend. The four friends began to meet regularly to play the guitar and the mandolin; then they had a go at singing the folk melodies they were playing. Not long after that, the group welcomed Renato and Giuseppe Jungg, Leo Seiser, Giuseppe Ranzi, Bruno Pasini and some others. But voices alone are not enough, if nobody is there to discover their collective force. Which is luckily what happened when Nino Peterlongo, the SOSAT’s founder and first president, arrived. One evening, he knocked at the Ranzis’ door, where the boys were rehearsing, and asked them to officially join SOSAT. This is how the Coro della Sezione Operaia Società Alpinisti Tridentini (the acronym of which is SOSAT) came to life. Since the onset, the spontaneity of the choir’s performance has won the audience’s favour, as it makes each concert a unique event, a once-in-a-lifetime experience. The high level of its artistic quality attracted the attention of important figures on the musical scene: first of all, Luigi Pigarelli and Antonio Pedrotti, who enriched the mountain chorus with a collection of songs and harmonies that would come to mark its history. Yet gloomy years were looming: with the anguish of dictatorship and the tragedy of the Second World War around the corner, everything became complicated, even singing. In 1931, unable to align SOSAT with its mass organisations, the fascist regime decided to put it under its authority. Nino Peterlongo was deprived of his role as president. Most members resigned, but the choristers chose not to abandon a very satisfactory project. The choir kept its name and in 1933 produced its first three records. Two years later, Edizioni F.lli Pedrotti released its first collection of mountain songs, harmonised by Luigi Pigarelli and Antonio Pedrotti. In 1938, after the promulgation of the special laws, the name SOSAT, which includes the term “workers”, was no longer convenient. The choir continued to perform under the name “Coro della SAT”, thus bringing the Società Alpinisti Tridentini (the mother company) into the alpine choir’s history. The choir had certainly paved the way for other artists to reveal their talent. As a matter of fact, it’s in a spirit of emulation that the Coro Val di Sella S.A.T. of Borgo came onto the scene in 1936; after WWII, it would become known as Coro Valsella. Although the impact of fascism, which even made itself felt on the history of alpine choirs, had forced the first of them to change its name from SOSAT to SAT, many people in the region continued to refer to it as “SOSAT”, at least until 1941, when the war forced the choir to stop performing. However, since the choristers’ passion for singing was stronger than the institutional constraints, the choir resumed its activity under a new name, “the SAT Choir”. 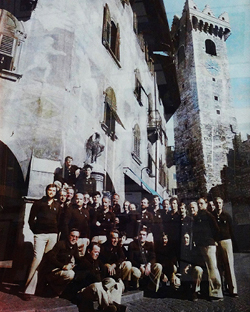 The former acronym, SOSAT, was re-assumed right after the war, when in May 1945, the first mayor of a newly liberated Trento, Gigino Battisti (son of the famous patriot Cesare Battisti), called upon Nino Peterlongo to revive SOSAT and its choir. In December 1945, when the war was definitely over, the four Pedrotti brothers (Mario, Enrico, Silvio and Aldo) decided – with the help of various former SOSAT choristers and new ones alike – to resume singing as “Coro della SAT”. With the revival of the SOSAT Choir and the resumption of performances by the Pedrotti brothers as the SAT Choir, this form of musical expression received a strong boost, and was set to gain in popularity in the following decades, to the point of prompting the creation of a representative entity for this impressively growing phenomenon. This led to the creation, in 1963, of the Federazione Trentina dei Cori, an association which represents one of the most significant initiatives in this field in our territory. Few areas in the world can boast such a high number of choirs as our region: 191 amateur and professional groups, with a wide range of styles, involving over 5,800 people of all ages, concentrated in one of the least inhabited regions in Italy. These figures prove the existence of a genuine, collective passion, a tradition with ancient roots which will outlive us. This first choir, founded in 1926, is now part of our common heritage, just like the mountains where it was born.